Recordable or Not Recordable? Know the Difference. For many employers, it can be difficult to know how to connect their workplace incidents with OSHA’s Recordkeeping Standard, 29 CFR 1904. 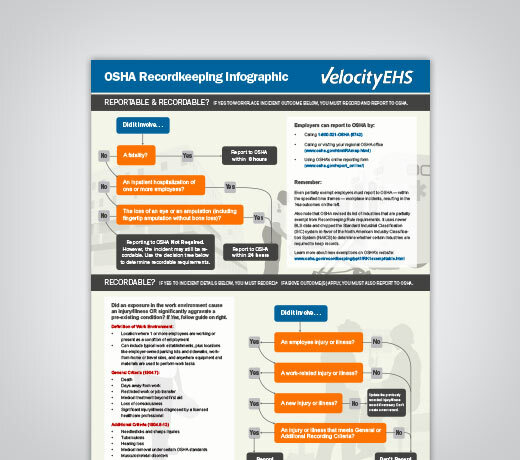 To help simplify the process, we’ve created a tool that can help users easily determine which workplace incidents are OSHA recordable or reportable. This guide can be used as a reference for EHS professionals, to help them know with confidence exactly when, as well as the exact number of hours, that certain incidents need to be reported within. 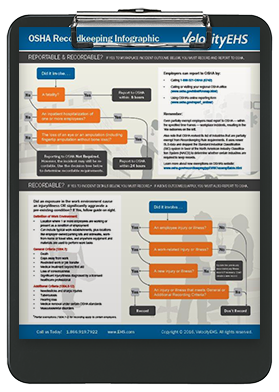 Save this Decision Tree to your PC or mobile device, or print and hang it in your work area for 24/7 guidance anytime an incident occurs. Eliminate even more of the guesswork with the cloud-based VelocityEHS Incident Management solution. Don't forget to post your OSHA Form 300A every February 1- April 30 in a conspicuous location for employees.